Buy this item and earn 1,945 ClubPoints. Dominion KSX II is an integrated, hardware-based solution that offers secure, remote KVM (Keyboard, Video and Mouse) access, serial device management and power control across remote branch locations. With Dominion KSX II, you'll enjoy secured, Out-Of-Band server/device access in a single 1U form factor. • One consolidated view of all IT equipment deployed at branch office locations. • A single, platform-independent, solution offering centralized, integrated and secure control. • BIOS-level control of KVM equipment and console-level control of serial devices. • Virtual Media, giving users the ability to transfer files for patches and upgrades from any location, speeding up the upgrade process and reducing travel costs. • Absolute Mouse Synchronization™, which reduces installation time and sets a new standard for mouse synchronization. • Network-independent access via a built-in modem for emergency access even when the network is unavailable. • Advanced security features like 256-bit AES encryption, configurable strong password support, and port-level permissions. Dominion KSX II offers direct access to troubleshoot and reboot all of your remote equipment including application servers, network appliances, switches, routers, firewalls, load balancers, and more. 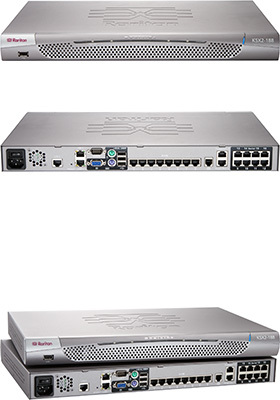 • KVM and serial control on a single unit: Save precious rack space in your remote locations by combining digital KVM and serial access and control in one appliance. • Virtual Media: Mount remote drives/media on the target server to support software installation, bug fixes, and upgrades. The Dominion KSX II supports a wide variety of media options, including CD/DVD drives, local drives, USB drives, and ISO image files. • Dual Gigabit Ethernet Ports with Failover: Provides high availability with dual gigabit Ethernet ports for redundancy. Should one Ethernet switch or interface card fail, Dominion KSX II will automatically failover to the other port and continue operating. • Built in modem with dial-back: The Dominion KSX II has a built-in modem for out-of-band access in case the primary network is unavailable. As an added security benefit, dial-back authentication is supported. • 256-bit AES Encryption: The Dominion KSX II uses the Advanced Encryption Standard (AES) encryption for added security. AES is a U.S. government approved cryptographic algorithm that is recommended by the National Institute of Standards and Technology (NIST) in the FIPS Standard 197. • Configurable Strong Password Checking: The Dominion KSX II has administrator-configurable, strong password checking to ensure that user created passwords meet corporate standards and are resistant to brute force hacking. The administrator can also enforce password aging and lockout after failed attempts. • Group and port-level permissions: Administrators can ensure that only the right people access remote IT equipment by setting permissions down to the port level. Administrators can also grant or deny virtual media and power cycling privileges. • RADIUS and LDAP and Active Directory® Authentication: Dominion KX II integrates with industry-standard directory servers, such as Microsoft's Active Directory, using either the LDAP or RADIUS protocols. This allows Dominion KSX II to use pre-existing username/password databases for security. • Absolute Mouse Synchronization™: The Absolute Mouse Synchronization feature is the ultimate mouse synchronization solution. For servers with a compatible USB mouse port, there is no need to adjust the mouse settings on the target server. This reduces installation time and enhances the Dominion KSX II's plug-and-play nature. In addition, the remote and target server mouse pointers never go out of synchronization. This feature is enabled by the new D2CIM-VUSB Virtual Media CIM. • Next Generation Common User Interface: The Dominion KSX II has a next generation, browser-based user interface for enhanced usability and productivity. This interface is common across the local port, remote access, management software as well as other Raritan products. This reduces training time and increases productivity. • Plug and Play Appliance Offers Quick and Easy Setup: Dominion KSX II is a completely self-contained system (i.e. an appliance). All KSX II features, including authentication and Web access, are built into the unit and do not require the use of an additional server. • Remote Power Control: The Dominion KSX II has two dedicated power control ports for Raritan PDUs like the Dominion PX. The enables administrators to remotely power cycle IT devices from the KSX II management interface. • SNMP Management and Syslog: The Dominion KSX II SNMP agent distributes SNMP traps for important system events to SNMP management systems. SNMP traps are fully configurable by the administrator. Syslog also supported. • Centralized management with Raritan CommandCenter® Secure Gateway: Like the rest of the Dominion Series, Dominion KSX II features CommandCenter Secure Gateway integration, allowing enterprise users to consolidate all Dominion devices into a single logical system, accessible from a single IP address, and under a single management interface. Listed below are additional products to consider which are compatible with Dominion KSX2-188. These items may be required to complete your system.